Spreading is the hardest part of the process, finding where all the stupid people download from. 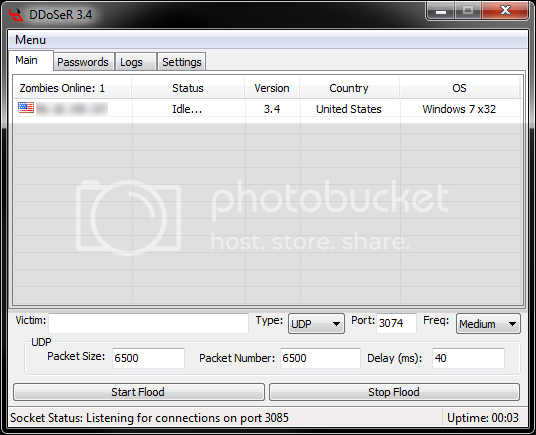 One method of spreading is torrents. Another method is YouTube videos. You make a video of something that someone wants, upload your binded/crypted bot to a downloading site like RapidShare or MegaUpload and say its what they want. You can also spread on forums. I won't explain it all, just say it's something that the members would want and post it for download. I wouldn't recommend spreading on hacking-related websites, they aren't as stupid. Binder and crypters are used to make your bot server less detectable by Anti-viruses. There are many out there, but public ones get detected fast. You can buy a private crypter that makes your server FUD (Fully Undetecable). As for public ones, there are many on this forum, just use the search box. You need to open ports to accept the incoming connections from the infected zombies, and also to send outgoing commands to them. For help on opening ports please go HERE. The ports that the above host booters run on are listed directly beside the title of them.